A feast-day dish popular throughout the Middle East, - usually made with chicken but even better with guinea fowl or pheasant. Wipe the pheasant, stuff the cavity with the bay leaf, lemon rind and cinnamon, and set it in a snug-fitting, heavy-bottomed casserole. Tuck the vegetables round the sides and pour in enough water to cover everything. Bring to the boil and skim off any grey foam which rises. Turn down the heat, add the peppercorns and a teaspoon of salt, seal tightly with a lid and leave to simmer gently for 1 - 1 1/2 hours, until the bird is perfectly tender. If you prefer, you can cook it in the oven at 180°C/gas 4. Remove from heat and leave the bird to cool in its broth. Meawhile, roast the peppers for about 30 minutes or until the flesh softens and the skin blisters black. Skin and cut into strips. Skin and debone the bird (reserve the bones), cut the meat into bite-sized strips and set aside. Strain the broth, discarding the vegetables and other debris, and return it to the pan with the bones. Boil rapidly until reduced to about half a litre (just less than a pint). During the reduction, prepare the sauce. Saving a few kernels for decoration, drop the walnuts and the bread into the food processor, whizz to a powder, add the lemon juice and a little of the broth, and process to a thick paste. Whisk in the strained hot broth until the sauce is the consistency of pouring cream. Taste and season. Remove a ladleful and process with half the roasted peppers to make a bright scarlet sauce. Dress the pheasant with the pale sauce and leave to cool. 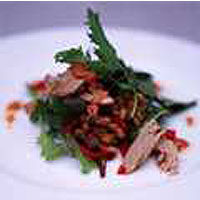 Just before serving, pile lightly on a heap of salad leaves in a dish. Drizzle over the scarlet sauce, garnish with the whole walnuts and the remaining peppers dressed with the walnut oil. Serve with hot pitta bread.